For each critiqued story, the winners—other than the author of the story—offer their critiques in two minutes or less. Tim and David then offer their own critiques. The exercise is less about these two particular stories and more about teaching the winners how to be an effective critiquer. After lunch, Tim and David spoke to the winners about the pros and cons of traditional publishing versus self-publishing. That was followed by three guest lectures by Writers of the Future Contest judges. 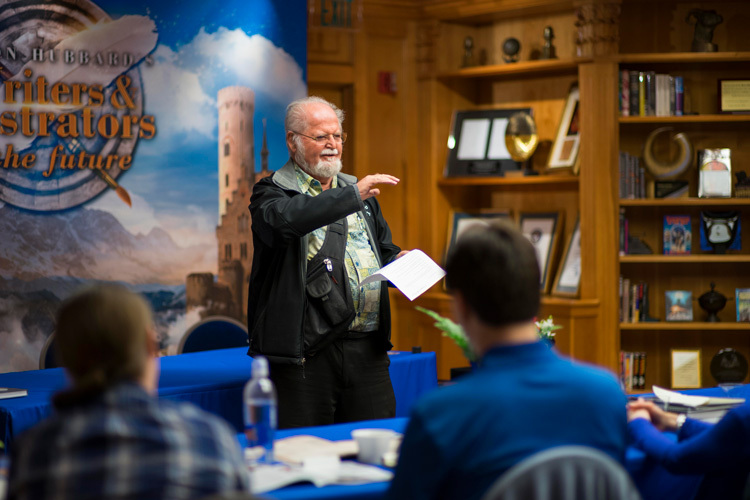 Mike Resnick, the field’s all-time leading award-winner for short fiction and the editor of Galaxy’s Edge magazine, focused on the business side of writing. Among other things, he explained the importance of reprints and foreign sales, contract option clauses, and various tax provisions. Jody Lynn Nye, author of dozens of novels and over a hundred short stories, talked to the winners about science fiction conventions, including practical advice on how to become a panelist or presenter at conventions, and how to act like a professional once you get there. 1. Your ability to solve problems with magic in a satisfying way is directly proportional to how well the reader understands said magic. 2. Limitations are more interesting than powers. 3. In worldbuilding, depth is better than width. He also revealed the existence of a “Zeroth Law” that takes precedence over the others: Always err on the side of what’s awesome. 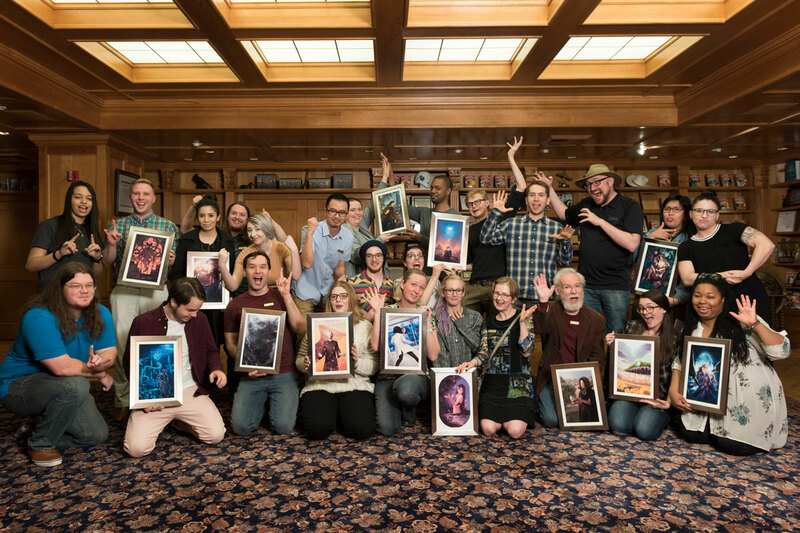 After the guest speakers, writers and illustrators, winners and judges all got together for a very large book signing party of Writers of the Future Volume 34. Early morning 8:00 a.m. and the Illustrator winners are learning about client management, networking, direct contact, mailing lists, website inclusion, in addition to directories used to find illustrators, and agents covered in detail by Echo and Lazarus. At 11:00, Illustrator Judge Larry Elmore enchanted us with his original art including traditional painting for National Lampoon and Heavy Metal in the 70’s. He described colors as flavors in traditional paintings when studying clouds and the different levels of colors in trees and nature depending on the light, time of day, and depth of field. He discussed how we each may see colors differently. I mentioned that scientists recently discovering that 1 out of 3 women can see a color that no one else can and no males can because extra cone(s) were detected. Lazarus reminded us of the effect of color blindness and found a website that showed the same painting with the loss of red, then blue, or green. Each example would be how a colorblind person views the painting and lack of that specific color. Pretty impressive! Larry in his talk emphasized that most people don’t “see.” Artists, however, “learn to see” —and training your eye is essential to see a Level 10 of color. Sometimes we achieve a level, say of a 7. Until you reach a higher level you cannot paint at a level 10, let alone appreciate the beauty and depth. It is something to strive for. To top off this wonderful day, the judges, winners and their families joined the Author Services and Galaxy staff on the roof of Author Services for a barbecue. Round tables set with deep blue velvet chairs were surrounded with lovely twinkle lights. A dozen heaters with tall yellow flames danced to keep us warm and the aroma of Al grilling burgers, sausages, and Wild Salmon lured us up to the rooftop. Joann and many of the staff contributed homemade slaw, potato salad, barbos, not to mention the dessert table with Haagen-Dazs chocolate walnut vanilla ice cream, toppings of berries and nuts, freshly homemade fruit cobblers, pies and a large assortment of coconut ice creams! Yum and Nom nom, nom. I looked around at the tables and will never forget the smiles, happy faces, and laughter of the winners!